Starting from Lorne Road, off London Road, Buckland and opposite Coombe Valley Road, the walk crosses the Dour by a bridge that was first erected by Thomas Hyde Page in the late 18th century. From the left (north) parapet there is an excellent view of the former Buckland corn mill, now apartments, waterwheel. 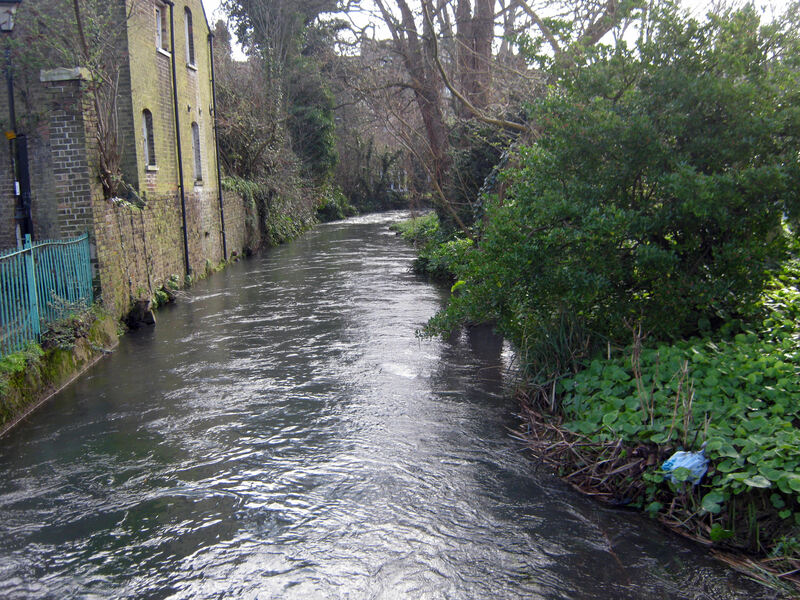 Upstream the Dour flows between London Road and Alfred Road into the former millpond. Owned by Criccieth Homes, in 2006 the pond was drained to repair damaged sluice gates and at the time it was reported that the pond would be open to the public. Eight years later, in 2014, it was reported that instead, the pond was being considered for use for hydroponics farming – the growing of plants in water without soil. 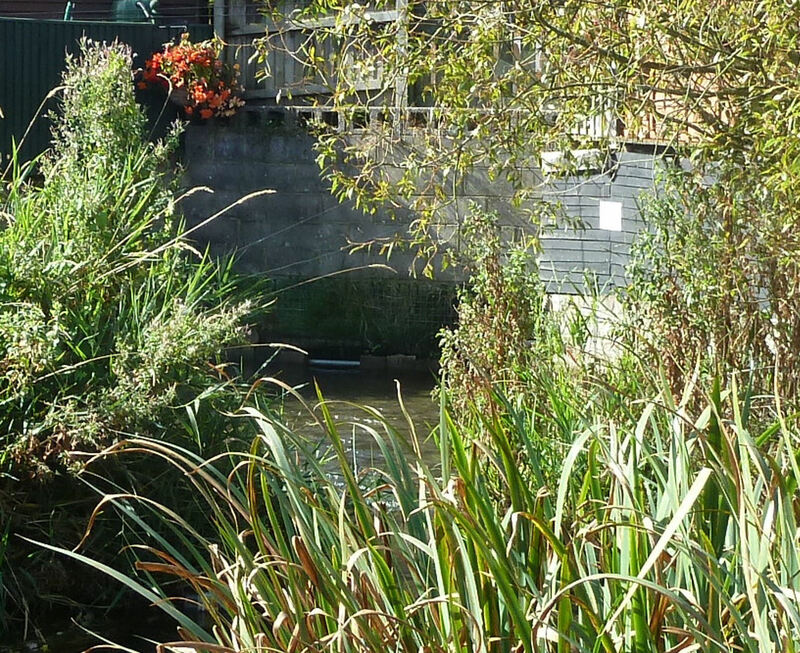 Two years later the millpond was put on the market with an asking price of £30,000. In response, moves were made to persuade Dover District Council to purchase it for community use but as yet this has not come to anything. Prior to Lorne Road coming into existence at the end of the 19th century, Brookfield nursery occupied the east side of the Dour. The site was bought by Worsfold and Hayward of Market Square and Lorne Road and Alfred Road were built but several years went by before the name of Lorne Road was extended across the bridge to London Road. On the north side of Lorne Road once stood an ancient corn mill that in 1775 became part of the newly built Lower Buckland paper mill. In 1846, builder, John Peirce of Bartholomew Terrace, bought the paper mill which he converted into a Brewery named after his hero, the Duke of Wellington (1769-1852). Later Wellington Brewery came into the possession of Peirce’s son-in-law, William Harding, who added his name. In November 1913, the Mannering family, who owned Buckland corn mill, bought the brewery for storage use but retained much of the equipment. In 1961, E M Gheysens, toy manufacturers, bought the site and the old buildings were demolished. The new premises eventually became a P&O training centre and they were followed by Steel Designers Construction. For a long time the building was allowed to fall into disrepair but since the building has been renovated and small firms have moved in. Opposite a new housing scheme is underway. 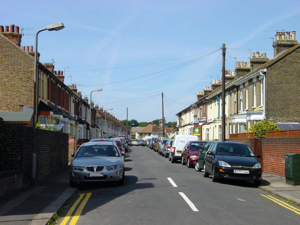 Further along Lorne Road, on the left, is the entrance into Alfred Road where the internationally celebrated singer/song writer/actress, Joss Stone, spent her early childhood. Born at Buckland Hospital, Coombe Valley Road, on 11 April 1987, she was named Jocelyn Eve Stoker and later attended St Mary’s Primary School. Her family moved to Ashill, Devon when Joss was about eight years old but her grandparents stayed in the area along with many of her relatives. Specialising in Soul music, between 2001 and 2003 Joss won the BBC Star for the Night and Steps to the Stars. Signed up by Steve Greenberg of S-Curve records, New York then EMI, recording in Los Angeles, Joss’s debut album, Soul Sessions was released in 2003. This was a huge success in both the United Kingdom and the United States and her second album, Mind, Body and Soul debuted at number one in the UK. In 2005, at the age of 17, Joss became the youngest ever winner of the British Female Solo Artist in the Brit. Awards! Having expanded her career into acting, Joss made her debut in the 2006 film Eragon and in 2011 played Anne of Cleves (1515-1547) 4th wife of Henry VIII (1509-1547). This was in The Tudors series on the US premium cable television channel Showtime. Joss always promised to return and give concerts in both Dover and Deal. This she fulfilled in March 2009, on stage at the Maison Dieu and the Castle Community Centre, Deal. Tickets sold out within hours! At the end of Lorne Road turn right into Barton Road, and perhaps call into the White Cliffs Bakery on the corner. Barton Road was originally a crooked narrow thoroughfare called Barton Back Lane and was given that name due the proximity of Barton Manor, later farm, that stood between the present road and the Dour. In 1861 this part of the road was slightly widened on the instigation of the Mayor, John Birmingham to provide work for the unemployed. Most of whom had been involved in building the London, Chatham and Dover Railway line and on completion had no further jobs to go to. By that time the road was known as ‘Love Lane’ as it was favoured by couples on fine summer evenings! Sir William Crundall (1847-1934), Dover’s Mayor 13 times, put an end to that in the 1880s when he started the development of the area that included housing between the old lane and the Dour. 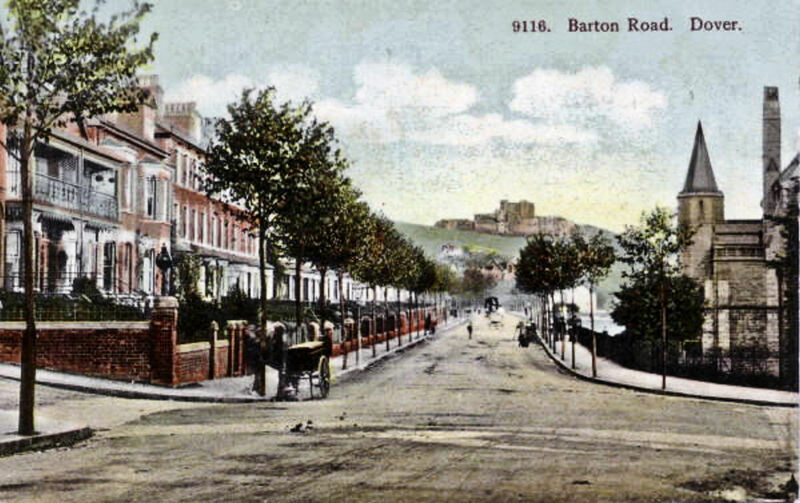 Renamed Barton Road, it was widened to its present dimensions in 1896. Cross Cherry Tree Avenue at the traffic light, turn right and the walk will take the first turning left. Go past the school playing field to Barton Path, just before the parade of shops. Before traversing the path, Cherry Tree Avenue was originally called Cherry Lane but was changed after houses were built in 1896 and trees, not cherry trees, were planted. On the opposite side from the footpath is a classic Co-operative building and next to it is the River Dour, with the remains of a small quay. The Dour goes under the Avenue and comes out east of Balfour Road. The latter was built about 1902 and was named after the then Prime Minister 1902-1905 Arthur Balfour (1848-1930). Before going to Barton Path, note the variety of different architectural styles of the properties along Cherry Tree Avenue, especially as most were built at the same time. On the left of Barton Path, up until the latter part of the 19th century, was Barton Meadow on which fairs were held. As Barton was rapidly being developed concern was expressed over the loss of open spaces and from ancient times, there has been a right of way from Barton Back Lane, skirting the south side of Barton Farm and the north side of SS Peter and Paul Church, Charlton, where the Dour was crossed on a plank to Beaconsfield Road. There was also another ancient path, owned by the Ecclesiastical Commission that ran along the east side of the Dour from St Andrews Church to SSPeter and Paul Church. 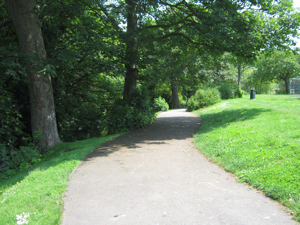 By 1890, Alderman George Birch, the proprietor of the then Falcon Hotel, at the corner of Bridge Street and London Road, was becoming increasingly concerned and called for a path along the Dour, which he named ‘The Barton Path.’ He envisaged that eventually the path would be extended both ways to run alongside the Dour throughout its whole course. Alderman Birch, set about persuading the Ecclesiastical Commission and Dover Corporation to use parts of the two paths to create ‘The Barton Path! An agreement was signed on 23 June 1893 and work started immediately. The council also agreed to purchase a strip of land on the opposite side of the river in order to ‘add to it’s beauty’ by planting trees. Albeit, they were outbid for the land by developers and Balfour Road was built. Nonetheless, the Barton Path was a success from the outset and in 1905, it was reported that an 18inch trout was found in the Dour along this stretch. However, at the time, the Dour was considered in law to be a watercourse and did not received river status until December 1993! 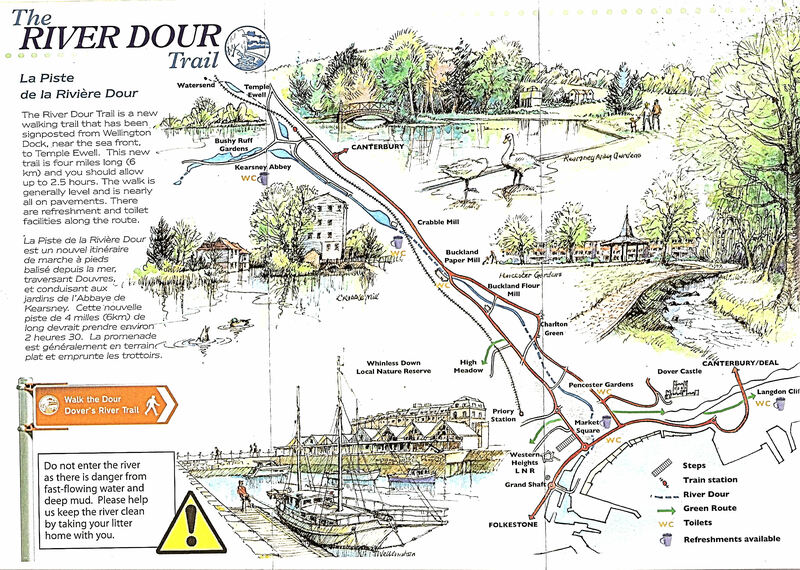 Further, Alderman Birch’s dream of a path alongside the full length of the river is still a dream – see latter section of Part I of the River Dour story. As a consequence of the development of Barton it was agreed to create a separate parish and to class the area as a village. 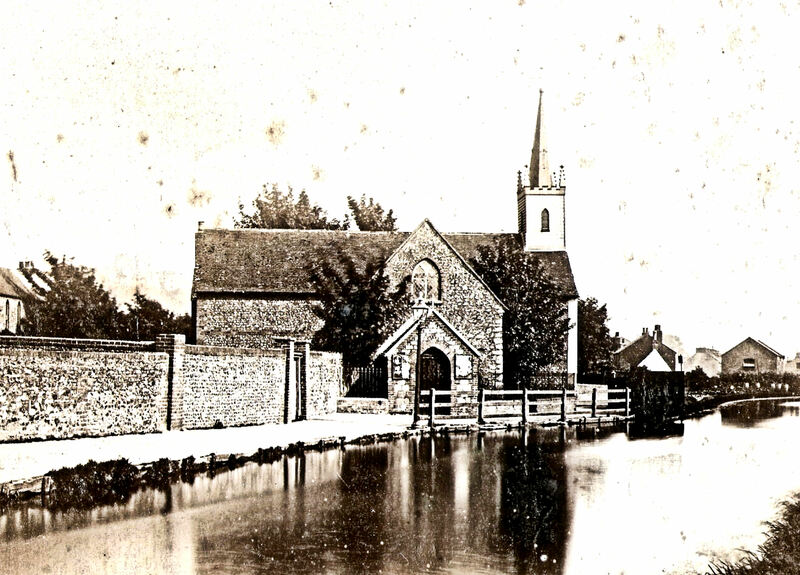 In 1901 St Barnabas Church was built on Barton Meadow, to the left of the start of Barton Path. The architect was Benjamin Ingelow, builder P.W. Paramor and it cost £6,130 4s 7d. The church was popular from the outset and a parish hall was erected between the Church and Barton School. However, in August 1940, during the Battle of Britain, the Church was severely damaged by a shell and subsequently demolished. 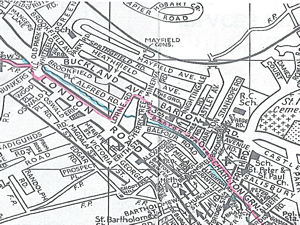 In 1953, due to the loss of the Church, the parish boundaries were redrawn and Barton became a hamlet of both Buckland and Charlton. The ruins of the Church were demolished the following year and the site became Barton School playing field. 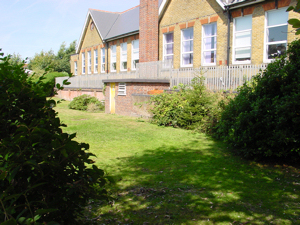 Along the Barton Path, on the left, is the back of Barton School. Envisaged in 1897 to meet the needs of the rapidly expanding Barton, at that time the children were attending Buckland School on London Road. Initially, it was agreed that the new school would accommodate 440 boys in four classrooms and it was designed as such by Cresswell and Newman of Castle Street. It was built by William G Lewis and the cost was £3,500 provided through charities connected with St Andrew’s Church. The building was started but due to national changes in education policies the number of places for the boys had to be reduced or more classrooms had to be built. Building stopped, discussions took place and in the end, it was agreed to keep the design and reduce the number of places to 240boys and build a separate infants school on the same site. Eventually, at the end of January 1903 the boys school, with four classrooms, opened and the infants school shortly after. Later, Dover Corporation purchased both schools but as the girls were still at Buckland school It was not until 1912 that an annex was opened to accommodate the girls. With the opening of Shatterlocks Boys’ School on Heathfield Avenue, in 1937, Barton Road infant school closed giving more accommodation for the girls. Following World War II (1939-1945) up until 1957, the school catered for children between the ages of 7 and 15. That year the £180,000 Archers Court Secondary School opened at Whitfield, now Christ Church Academy, and Barton School became a junior school. Further along the path, on what was originally Barton Manor farmland 106 houses on four roads were built back in the 1880s. They were Limes Road, Charlton Avenue, the Grove and Beaconsfield Avenue and more about the latter later. Limes Road was built first and runs from Barton Path to Barton Road. When building was under way, it was found that there was enough room to fit in a few more houses by sacrificing a couple of houses on Limes Road and creating a short road at right angles to the school boundary. This became the Grove. Parallel to Limes Road, Charlton Avenue was built on the actual site of Barton Manor/farmhouse and both Limes Road and Charlton Avenue can be accessed from Barton Path. Near the opposite bank of the Dour from Limes Road, is a triangular indent that once was a sluice gate and weir, only the weir remains. This was created to control the amount of water in the millpond when Chitty’s corn mill, further down stream, was in existence. 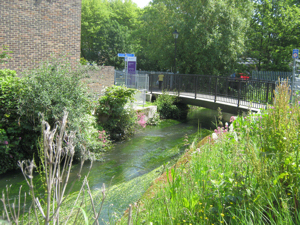 The stream goes under Balfour Road, Halford’s on Bridge Street emerging below the bridge on the opposite side of the road at Charlton Green through the most western of the 3 arches. Another local girl who found fame in the United States, once lived on the small estate by the banks of the Dour. Sonita Henry was born on 23 January 1977, attending Charlton school followed by the Dover Girls’ Grammar school and South Kent College where she read media studies. On moving to New York in 1997 she quickly became well known as a photographic model, then moved to Los Angeles. There she was given a part in The Fifth Element (1997). More films, television programmes and commercials followed. The Land Rover Discovery commercial was screened in the UK and of her many films, Sonita’s most notable recent part was that of the doctor who delivered Captain Kirk in the film Star Trek (2009) – The town can now boast that the first person to hold the famous Captain came from Dover! 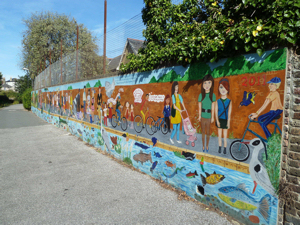 The wall that separates Barton School and the back gardens of properties from Barton path is highly decorated with murals. They were first painted by 160 Dover school pupils back in 2011. The pupils mainly came from Barton Road Junior school, Charlton Primary school and Dover Girls’ Grammar school and the works were dome under the supervision of local artist, Anita Luckett. When completed, anti-vandal varnish was used to protect the colourful work. Albeit the natural elements took their toll and in 2013 the murals were restored and dedicated to former Dover Town Mayor, Diane Smallwood, who had died the previous year. Councillor Jim Hood funded the restoration. Barton Path finishes at Beaconsfield Avenue, the fourth of the roads built on Barton Manor farmland. The ancient footpath, mentioned above, crossed the Dour on planks to Beaconsfield Road when it was planned in 1866. However, the Road was not built until 1881 and was named in honour of the recently deceased Prime Minister (1874 to 1880) Benjamin Disraeli (1834-1881). At that time a brick foot bridge was built across the Dour and John Beach (1842-1895) from Kings Lynn, Norfolk, owned the Sedgemeade cork factory next to the river. 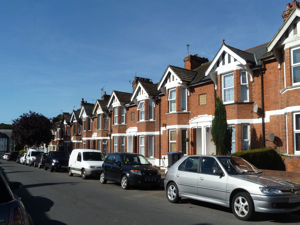 His residence was Sedgemeade House on Beaconsfield Road and is now a dental practice. The road bridge we see today was built in 1902 and as this created a continuation of Beaconsfield Road to Barton Road, the new road was named Beaconsfield Avenue. Although it is generally known that on Thursday 23 June 2016, the people of the United Kingdom voted to leave the Economic Union and in Dover District the tally was 62.2% – 40,410 wanting to leave. Back in the early 1970s the feeling was different and the majority in the area voted to join and in 1992, those who supported the notion of a politically unified Europe saw the creation of a Single European Market as the greatest achievement thus far. What many did not realise that it was a Dovorian, Arthur Cockfield (1916-2007), who had lived in Beaconsfield Avenue as a child and went on to attend Dover Boys’ Grammar School, achieved this! In September 1984, aged 68, Cockfield was appointed to the European Commission under pro-European Jacques Delors. In less than a year, Cockfield produced a White Paper listing 283 barriers that needed to be abolished to create a ‘frontier-free Europe.’ Against every barrier, he listed what needed to be done to abolish them and a timetable to carry this out by December 1992. A year before the deadline, on 07 February 1992, the Maarstricht Treaty was signed and when it became effective on 1 November 1993, it took Jacque Delors vision of a European Economic, Monetary and Political Union, to the next stage. On time, the first part of that dream came into force – the Single European Market. Since then it has evolved into the European Union with more countries joining but in June 51.9% of UK citizens voted to leave. On time, the first part of that dream came into force – the Single European Market. Since then it has evolved into the European Union with more countries joining but in June 2016, 51.9% of UK citizens voted to leave. Crossing Beaconsfield Avenue the walk enters Charlton and the ancient boundary between Charlton and Buckland was along Charlton’s SS Peter & Paul Church north wall. The path we are taking is besides the west wall of SS Peter & Paul Churchyard, Charlton Green. On the right, behind newly built residences, is the Dour. 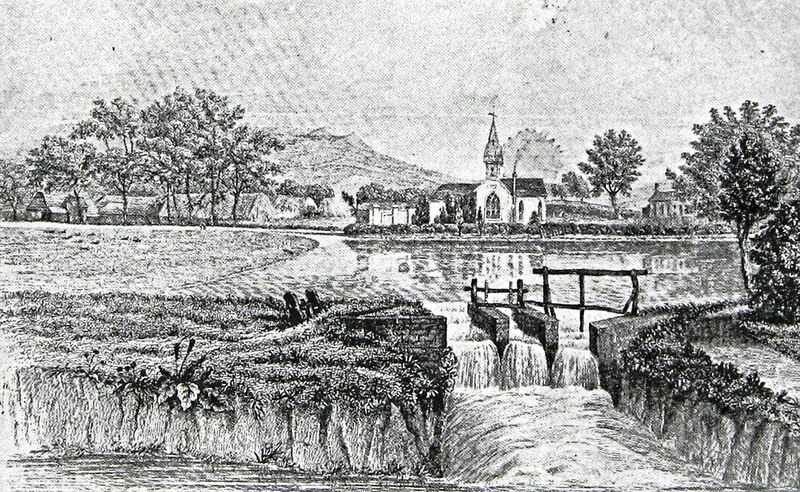 The original Church was built before 1291 and was very close to the banks of the Dour, as can be seen in the picture below. It was said that this was to enable baptism to take place in the river. At the time the Church and its tithes belonged to Bartholomew de Badlesmere (1275-1322), but he was hung, drawn and quartered for treason on 14 April 1322 at Blean, near Canterbury! After the Reformation (1529-1536) the Church was transferred to John Monins and remained in the Monins family until 1888 when it came under the patronage of Keeble College, Oxford. Between 1514 and 1541 Sir John Clark, the Master of the Maison Dieu, was the rector of Charlton Church. Around 1495, he had sought Henry VII’s (1485-1509) patronage to turn a small natural cove at Archcliffe Point into a commodious harbour – the start of what eventually became Western Docks. In 1827 the Dour side Church was rebuilt on the same site and in 1840, Charlton’s parochial school was built near the church. In 1888 the Rev Sidney Faithorn Green was given the incumbency. He was High Church, which at that time was highly controversial as Low Church beliefs were in the ascendancy. For his beliefs, Green spent time incarcerated in prison but was welcomed by the Charlton parishioners. It was during his incumbency that the present SS Peter and Paul Church was built. Consecrated on 19 April 1893, the new Church was designed by James Brooks (1825-1901), built by J J Wise of Deal, cost over £13,000 and has 700 sittings. The new Charlton Church was built in what had been the old Churchyard, and when the old church was demolished the ground became part of the present Churchyard. It was at that time that the present Charlton Green path was laid to give a continuance of the Barton Path. On the opposite side of the Dour stood Charlton mill. In consequence, this part of the Dour was the millpond and therefore much wider than it is today. The reclaimed land of the former millpond has, in recent years, been given over to housing. The wall we see today, was built on Church side of the path with an entrance into the Churchyard. Besides being a haven of tranquillity, the Churchyard does have many interesting things to see. These include a plaque set in the grass marking the site where the altar of the old church had stood. 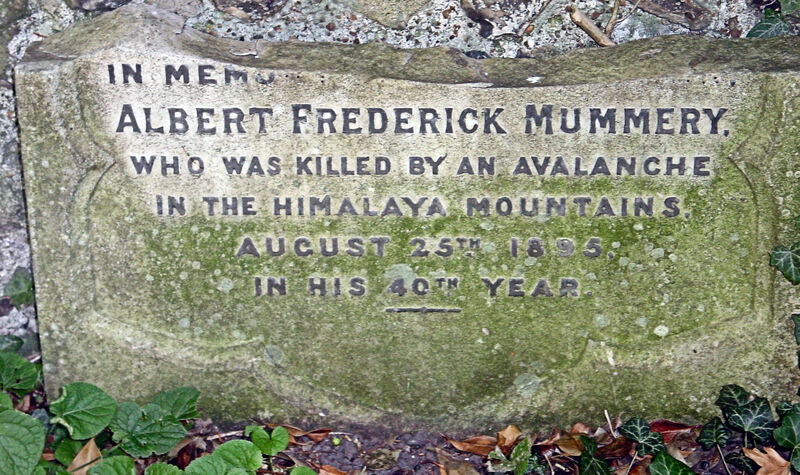 There is also a broken gravestone near the far wall close to Frith Road, dedicated to the internationally recognised Father of Modern Mountaineering, Albert Mummery (1855-1895) who lost his life in the Himalayas. 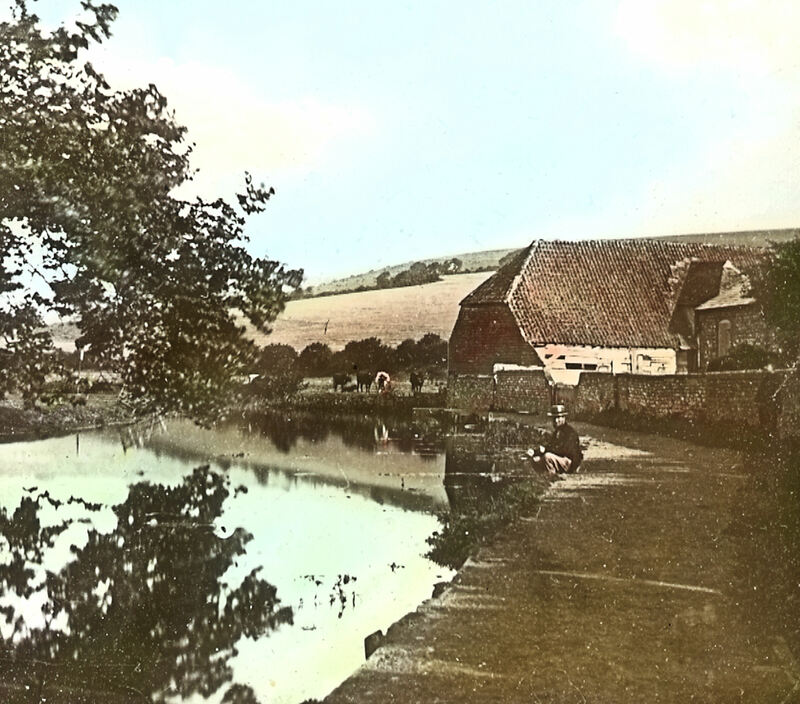 Mention has been made of Charlton corn mill, that stood on the opposite side of the Dour, where Halfords is today. Briefly, the mill was bought in 1865 by George Chitty (1842-1915) and from then on was colloquially called Chitty’s mill. Among the many modifications he made was the introduction of a 200 horsepower steam engine to replace the water wheel. For this he had a water tower built, which in World War II was used as a target by enemy guns. On 2 September 1944, a shell exploded on the roof and a hot piece of shrapnel, lodged in the roof timbers and smouldered. By the time the fire brigade arrived, the roof was well alight and the mill never re-opened. Back in 1706, opposite the mill and near the old Church was a farmhouse owned by a John Hubbard. Five years later, on his death, his son Clement became the owner and he added a forge to the property. By 1726, this had become a large farm and was sold to Francis Ralph for £240. With his wife Patchell and eleven children, Ralph moved in and the family remained there until the early 1800’s. The much-reduced estate was bought by Flavius Josephus Kingsford (circa1758-1851), a farmer and miller on Bulwark Hill, above the Pier District on Western Heights. By 1805 he had converted the old farmhouse and registered it as the Red Lion alehouse. Flavius had two sons, Edward (1801-1864) and Alfred (1803-1878) and when Edward was old enough, Flavius gave him the Red Lion. The inn, as it became, was listed in Pigot’s directory of 1824. By 1849, Flavius’s other son Alfred, who owned the Windmill brewery on the corner of London Road and what is now Coombe Valley Road, had taken over the Red Lion. 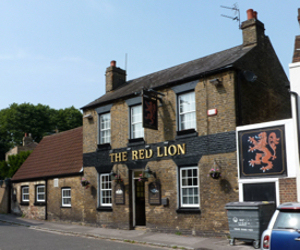 That year Alfred Kingsford had the farmhouse demolished and the present Red Lion was built on the site. Ten years later he sold the pub to Alfred Leney senior (1837-1900) of Phoenix Brewery, Dolphin Lane. They merged with Fremlins in 1926 and Whitbreads in 1967. In 1952 the Red Lion landlord, Leonard Latchem, had the first outdoor skittle alley in the area laid. This was opened on 6 June by Dover football legend, Fred Durrant (1921-2010), former centre forward for Queen Park Rangers (1946-1949) and at the time he opened the skittle alley, manager of Dover Football Club (1950-1957). Other pubs soon followed the Red Lion, opening skittle alleys and eventually competing for the Latchem trophy. Next to the Red Lion was the mill owners’ house. Appropriately called Mill Cottage but nowadays renamed Drove House and next door are the Dour Side Cottages. Although the walk continues along Charlton Green it is necessary to cross the busy Bridge Street. The safest way is by the pelican crossing east of the bridge over the Dour. When the bridge was erected in 1829, it gave the ancient thoroughfare the name of Bridge Street. Before that date there were two wooden foot bridges at this end of Bridge Street, crossing two branches of the Dour. 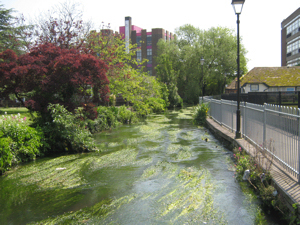 The main stream, which today the north parapet of the Bridge Street bridge goes over, and the other wooden bridge over the stream mentioned above that goes under Balfour Road. Both streams come together through three arches below the bridge on the south side. Although difficult to see, because of the foliage, the stream from Balfour Road comes through the west arch and the main river comes through the other two arches. The footpath, alongside the very busy Maison Dieu Road, is wide as it is a shared cycle path. 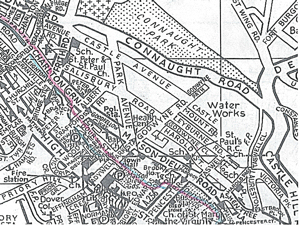 Before 1861, the road was called Charlton Back Lane going down to the sea and favoured by smugglers. What is now Castleton Shopping centre, Morrisons superstore and car parks on the right, was once the actual Charlton Green but was covered by houses during the early part of the 19th century and by the end of the century and by World War II, much was covered by Dover Engineering Works. 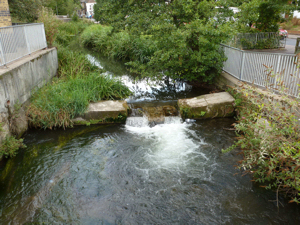 To enable this development to take place the Dour goes over a weir and through underground culverts emerging diagonally opposite at Crafford Street. Next to Morrisons the Dour is quite wide and although housing developments, road laying, the preference for concrete over grass and lack of consideration by Dover Harbour Board have together created a regular flooding problem for the lower parts of town. 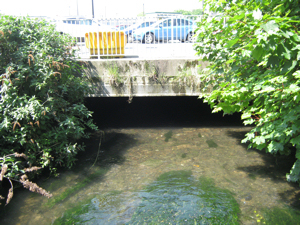 This was addressed by the Environment Agency that carried out a River Dour Improvements Study. Their conclusions confirmed that the wide channel below Bridge Street bridge plus the weir before the culvert taking the river across the car parks caused the flow of water to slow down. In turn, they stated, this caused build up of sediment that exacerbates the proneness to flooding. 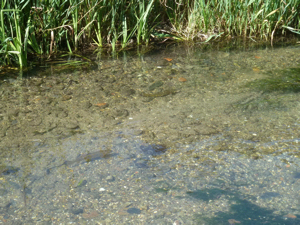 In 2013 they undertook a major operation lasting five weeks clearing the sediment and opening up the river. At the time of writing, three years later, the situation is as it was plus, due to lack of financial resources, many surface drain gullys in the area are blocked with sediment such that floods still regularly occur! 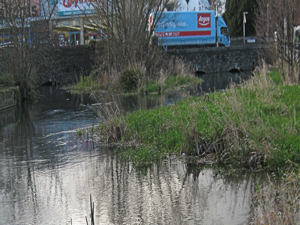 Over a century after the notion of a Dour riverside walk from Kearsney Abbey to Wellington Dock, work began on a walking and cycling route in 2010. The wide path along the side of Maison Dieu Road was the first section completed that year. At the same time, on wasteland between Morrisons and the Dour a small ‘park’ was created and can be accessed from the path on the café side of the store. Across the busy Maison Dieu Road, best accessed by crossing at the traffic lights, are two places of interest. Facing the crossing and along Maison Dieu Road was a classic 1950s industrial building that the town should have been proud of but was demolished in early 2019 to build a McCarthy & Stone of Bournemouth, retirements apartment block. The demolished building was a MO Valve Company factory that opened in 1952 but they vacated it five years later. 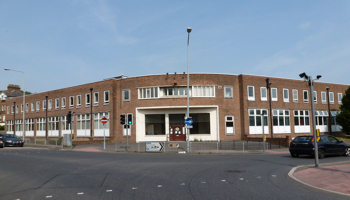 It then became a Royal Mail foreign mails’ depot, which closed in 2003 and since then the building had a variety of occupants but was generally neglected. It had been hoped, when McCarthy & Stone bought the premises, they would have incorporated the iconic front entrance but sadly this was the first part to go. Nearby is the Louis Armstrong pub a well known jazz and folk venue where the LA Music Club, whose president is Nick ‘Topper’ Headon of the Clash, gives young musicians the chance to play with professionals to improve their skills. Nearby is the Louis Armstrong pub, a well known jazz and folk venue where the LA Music Club, whose president is Nick ‘Topper’ Headon of the Clash, gives young musicians the chance to play with professionals to improve their skills. Returning to the traffic lights to re-cross the Maison Dieu Road, the walk continues on the wide path alongside the busy road to the Castleton Shopping Centre vehicle entrance and exit. The entrance is particularly dangerous as drivers frequently fail to indicate that they are going to turn in. Further, many vehicles cut the corner by mounting the curb and DO NOT seem to notice that there may be pedestrians waiting to cross. After crossing the vehicle entrance and exit, the path turns sharp right then left, alongside the car park and comes out onto Crafford Street. Crafford Street was named after John Crafford the Lay Master of the Maison Dieu during the reign of Henry VII (1485-1509). It was formally adopted in 1868 when Thomas Chaney, a local carpenter built the first houses there. 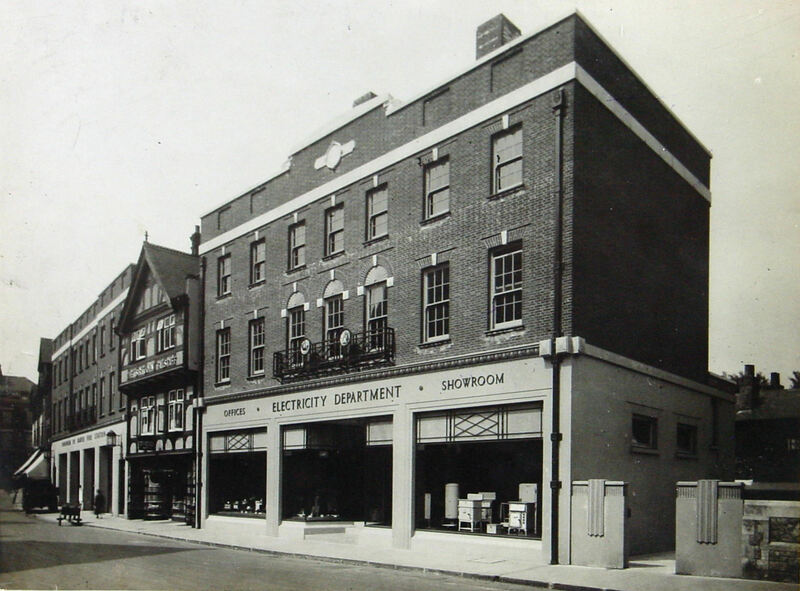 From 1928 to 1988 the Dover Co-operative Society’s large dairy was on Crafford Street but the only function of the street now is as an access from Maison Dieu Road to the Charlton Shopping Centre car park. This development, owned by Park Rutland, opened in September 1980 and was part of a £3m complex. At the time it included a large Sainsbury’s supermarket. It cost the owner of the freehold, AXAEquity and Law, £1.5m and faced the High Street. Having resulted in the closure of numerous small shops in the vicinity, Sainsbury’s closed the store in 1992 with 41years on the lease to run. The freehold owners sold the premises for £2.2m by which time the use of the multi-storey car park had diminished. Just before the entrance to the car park the Dour emerges from under the concrete of the Castleton Shopping Centre car park. 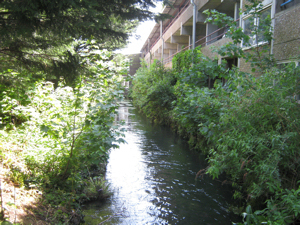 After passing under Crafford Street the river comes out between housing on the left and the Charlton Centre car park on the right. Nonetheless, there is a short but pretty view down the river. The walk, after Crafford Street goes along Dour Street, much of which is lined with pretty cottages but the pavement is often blighted with litter. At the north end of Dour Street, on the left is Charlton House, a modern building that was erected by Adams Printers in 1990. The company was founded in 1888 by bookbinder Arthur Robert Adams (1855-1928) in Priory Street, moving to 37 Castle Street in 1909. 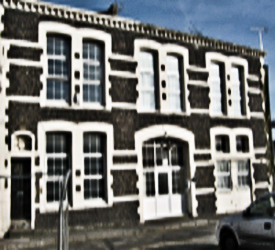 Needing larger premises, they moved to the former Southern Television Studios in Russell Street in 1983. Later that decade, Dover District Council wanted the site for an extended car park to accommodate visitors to the ill-fated White Cliffs Experience that was built adjacent to the Market Square. The family run business therefore invested in the purpose built premises we see today on Dour Street. Budge (Arthur Finnis) Adams (1909-2000), who was at the helm of the company for much of the 20th century, was a keen local historian who lived in Castle Hill House. The land on which Dour Street was built, was originally owned by the Crown but farmed by the Gorley family as part of their Ladywell farm. When the foundations were laid for the first four houses, it was to be called Gore Street but the builders, Messrs Nightingale and Bushell, hadn’t sought planning permission. Further, they had not made any effort to include infrastructure such as water supply pipes and a sewer. Altercations took place between them and the council and three years later, they agreed to comply, including changing the name to Dour Street. Most of the properties date from that time and when finished they were well sought after pretty cottages lining both sides of the street. Then on the evening of Thursday 2 October 1941, during World War II, three German Heinkel III’s dropped their bombs on the town when cottages in Dour Street were hit. James and Annie Tapsell, Patrick Carberry and Frank Field were killed. Following the War the flats that we see today on the east side were built on the bombsite. 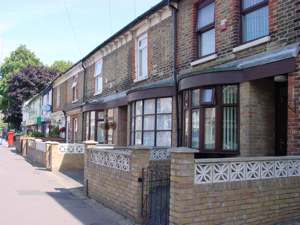 Although called Dour Street, it is evident that between the street and the river there are modern residences. These are on Goodfellow Way, named after the Mayor of Dover in 1972, Cllr. Kathleen Goodfellow. When Dour Street was laid out in 1862, Alfred Matthew’s building yard stopped the cottages on the west side of the street abutting the river. William Crundall senior (c1823-1888) bought the building yard in 1856 and after buying the extensively wooded part of the former Jarvis estate that is now Pencester Gardens, opened a saw mill business on the site. 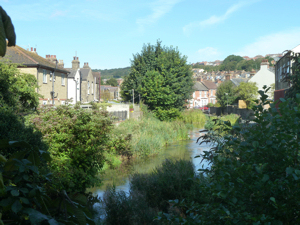 Under the management of his son Sir William Crundall, the long term Mayor of Dover, the saw mill site expanded to occupy both side of the Dour over which connecting bridges were erected. The sawmills finally closed after over 100years on the site and Charlton Shopping Centre was built on the west side of the Dour and Goodfellow Way on the east side. At the south end of Dour Street are Park Street and Park Place. Built by Charles Gorley on Crown land, the properties on the left side of Dour Street and the opposite side of the road were completed by 1861. At the time the area was called Maison Dieu Park and the provisional name given was Park Street, which stuck. About the same time the line of shops on the right, with the Park Inn next to the Dour, were built and causing confusion ever since, were called Park Place. The council stipulated that the shops were to be for retail purposes and that there should be no competing businesses. 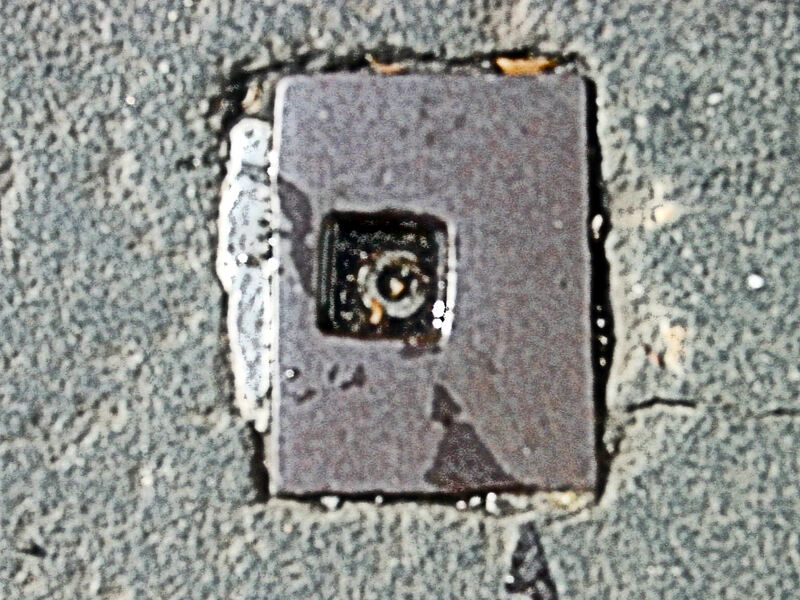 Further, to comply with an 1815 ruling, they were permitted to have shop blinds projecting over the pavement with supports at least seven feet from the ground fitting into iron brackets in the pavement. The iron brackets were at the owners expense and a couple can still be seen today. Park Inn, at the time of writing is up for sale. A free house, the pub is said to be haunted by a Madam who once kept a brothel there! Park Street/Park Place becomes Ladywell when the road bridge crosses over Dour! 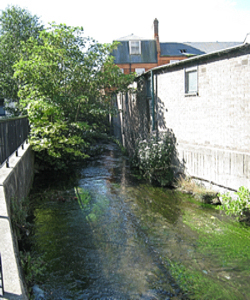 In fact Ladywell is an ancient street named after one of the town’s original main wells, the Well of Our Lady, which dated back to possibly Saxon times. The Well was in a wall on the south side of the street and provided chalybeate, (containing iron) water that was said to be beneficial for sickness and long term maladies. To access the Well, stone steps went down to enable folk to fill their buckets. For the more affluent, the water was taken around the town by men wearing white smocks shouting ‘a penny a pail.’ For reasons unclear, they were all generally called ‘Old Ned’ – either that or one of the men lived for a couple of hundred years and had several clones! The water was said to make the best cup of tea and was sought after, both in the town and as far away as London. However, in 1836 the new town gaol was built as an extension to the newly acquired Maison Dieu on the Ladywell side. To accommodate the gaol, alterations were made to the Well but in 1866 an analysis showed the Ladywell water was contaminated by human waste from the prison! The Well was immediately closed down and the gaol closed in 1878. On the north side of Ladywell is the architectural classic 1930s retail building. It was purpose built as the town’s electricity showrooms, at a time when Dover produced its own electricity! Next door is the Fleurs pub, built in 1903 as Sir John Falstaff. Back in 1795, Thomas Harrison built four cottages on the site of the present day Fleurs and by 1865, they were owned by butcher, Thomas Royce. He converted two of the cottages into a hostelry which he named Falstaff, after the Shakespearean comic character. In 1900, Ladywell was widened and the buildings were demolished but three years later the pub we see today was built with the stunning tiling and stonework and renamed the Sir John Falstaff. Next door to the pub is Dover Fire Station that has a long and dramatic history as can be read on this website. 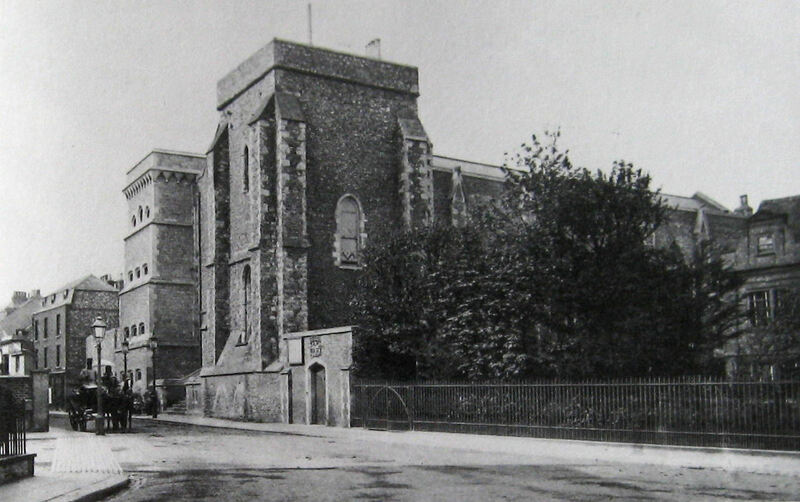 On the south side of Ladywell, Connaught Hall and the former Art and Technical college replaced the town gaol. Next to the former college is Ladywell car park and of interest are the two wartime bomb cases that are now used to protect the wall on both sides. Between the car park and the Dour is a footpath alongside the Dour. On the opposite side of the river is Dover Police station. Dover once had its own police force that included the fire service. Back in the 1930s, having built a new fire station it was decided to build a fine new police station for the town to be proud of. The foundation stone was laid on 29 July 1939 by Mayor Jimmy Cairns and as World War II was anticipated, the cellars were designed to take bomb blasts. The new police station opened on 4 October 1940 but by the end of the year, it had been devastated by bombing. Repaired, the building was subsequently damaged on eighteen further separate occasions by enemy action! On three occasions the damage was serious. On 1 April 1943 Dover police force amalgamated with Kent Constabulary and since the end of the War the town’s police station has steadily been down graded in relative importance. The footpath from Ladywell to Pencester Road was started in 1972 when Kent Education Committee gave up land on condition that the town should bear the cost of laying and maintaining it. This included, if necessary, fencing but Dover council went further by providing large planters nearly all the way to Pencester Road, in which for years, there were superb flower displays. Sadly, a change in policy meant that the planters were neglected and many were removed. Those that remain tend to be used as litter bins. Both the Ladywell/Park Street bridge and the wall at the police station side of the river are worth a closer look. Under the bridge, the old river bridge can still be seen while the wall can be seen to be made up of a mish-mash of building materials and hewn blocks of stone. It is generally believed that these building materials came from the base of the Union Hall, built as a Ragged School for destitute boys back in 1850 by Wilfred Mowll. When the school closed in 1892, the building became a chapel for the use of any religious sect that did not have its own premises but was demolished in the late 1930s to make way for the police station. The building on the right facing the car park is Biggin Hall built in 1881 and from 1894 to 1942 it was the municipal bathing house. It then became the temporary home of Dover Library following which, it was refurbished as a public hall. Having been used by many organisations it was then leased out, with the Oddfellows among others, becoming tenants. In October 2013, it was reported that following negotiations with Dover District Council, it had been agreed to ‘give’ Biggin Hall to the Dover Community Association for £1. The Association had sold Cleary House, on Maison Dieu Road, for £220,000 the previous year and agreed to refurbish Biggin Hall. Work started on this in spring 2016. Past Biggin Hall, on the right, is Kent County Council’s Well Community Resource Centre, formerly Dover children’s library. This faces a path going from Biggin Street to Maison Dieu Road onto which the walk will take a detour. Turning left and crossing the Dour bridge, lift the foliage on the left side of the south parapet. 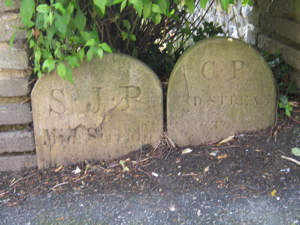 There, two ancient boundary stones can be seen that depict the boundaries of St James’ and Charlton parishes. There once was a third stone representing St Mary’s parish on the opposite side of the south parapet. 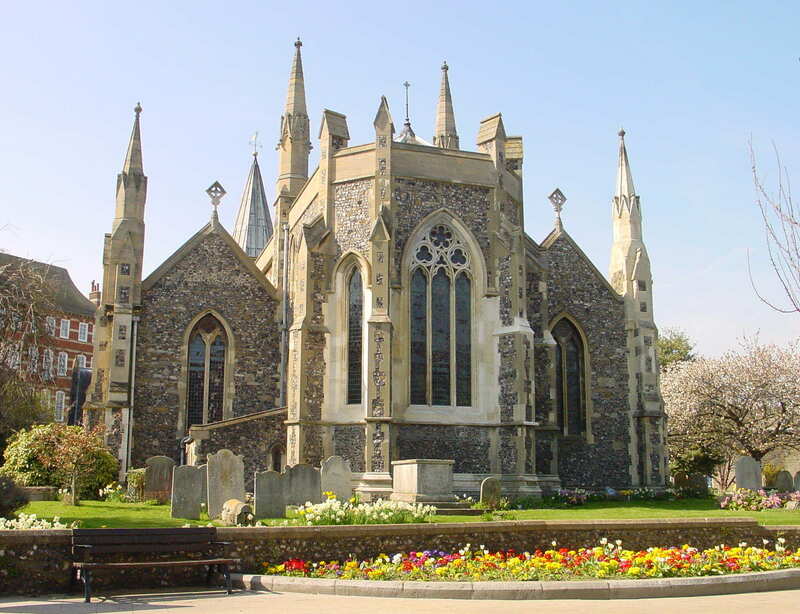 Dover was originally divided into two parishes, St Mary’s created in 1535, following the Reformation (1529-1536) and St James’ parish, headed by St James’ old church – the ruins of which are near the present swimming pool on Woolcomber Street – later. Charlton juxtaposed with both in the vicinity of this bridge. The local tax or rates as they were later called, was the main source of income to all the parishes and therefore they jealously guarded their boundaries in order to received their full dues. The actual boundary between St James and Charlton was on the east side of the bridge while the boundary between St Mary’s and Charlton was along Ladywell. 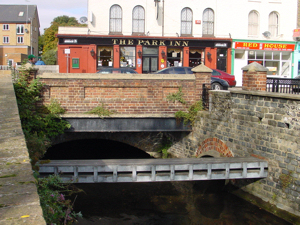 The boundary between St Mary’s and St James was from this bridge to Stembrook – down the centre of the Dour. Thus it was the custom of the Town Crier, during the beating of the bounds to wade down the centre of the river to proclaim the boundary! In 1953, the parishes merged and the St Mary boundary stone disappeared. Carrying on along this path towards Maison Dieu Road, the north wall, on the left, was once the northern boundary wall of Brook House that was bought by John Birmingham, Mayor in 1860. In 1868 he had walls built surrounding his property and erected ownership plaques on all four sides. On the north wall his now almost illegible plaque can be seen and a similar but better-preserved one can be seen on the southern wall of what was his property at the rear of Pencester Road car park. Brook House was a beautiful mid-Victorian building that was bought by Dover Corporation in 1920 and the surrounding gardens, renamed Maison Dieu Gardens, were open to the public. 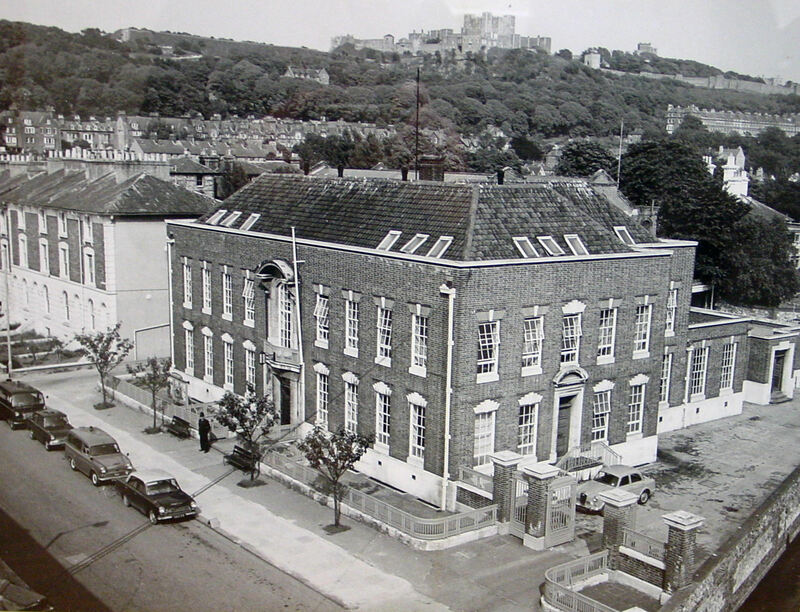 However, at 05.00hrs on Saturday 16 July 1988, the building was bulldozed into oblivion in order to provide a coach park for the ill-fated White Cliffs Experience, now the Library, just off the Market Square. Further along this path just before what was once Brook House stable-block, the Dover Electricity Station main-gate post can be seen. The station opened in 1891 and provided Dover’s electricity until the introduction of the Grid system in the early 1930s. From then on it provided electricity to the central Grid until it was nationalised under the 1947 Electricity Act. Part of the power station was converted into a substation but most of the empty buildings remained until demolished in June 1985, that is with the exception of the gatepost and walls now in the adjacent police station car park. Turning round, the walk heads towards the bridge and on the left are the Riverside Gardens and Riverside Centre. 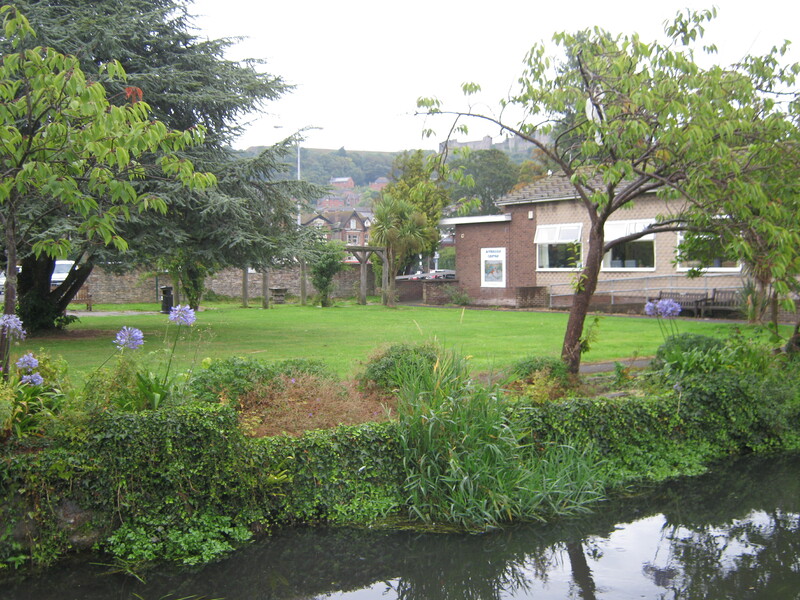 In 1965, Dover Corporation gave this land and £5000 towards the Dover Old Peoples Community Centre. The Centre opened on 1 November 1967, and quickly assumed the name Riverside Centre. This name included the surrounding garden. In 1969 the Czechoslovakian ambassador, dedicated part of the gardens to Lidice – a former mining village near Prague that was destroyed and the inhabitants murdered by the Nazi’s on 10 June 1942. A commemorative plaque was erected nearby but this has long since disappeared. In the Garden there are several dedicated seats and it is a nice quiet oasis. Crossing back over the bridge to the Dour side path, on the right is Dover Bowling Club headquarters. Founded as the Dover Institute Bowling Club in 1907 it quickly proved to be very successful. However, during World War II the green succumbed to a direct hit by a bomb – it is said that one of the bomb casings at the entrance to Ladywell car park is the remains of the culprit. The club was renamed the Dover Bowling Club and after major repairs, the Green reopened in 1955, since when the club has remained successful. The fairly modern building overlooking the Green was once the local British Telecommunications headquarters. The path continues alongside the Dour and on the other side, after the Riverside Centre, are the grounds of Dover’s once named College of Further Education. It was built in 1982, based on a design to replicate the Keep at Dover Castle and cost £1million. Subject to reorganisations, financial problems and changes of names, the college has, nevertheless remained popular. The path now takes a sharp left to across the Dour on the specially constructed footpath/cycle bridge. Then, after a short walk, on reaching the gates of the College, a sharp turn right on to the wide path/drive leading from the college to Pencester Road. Pencester Road was originally a right of way footpath from Biggin Street and up the hills to the east and the river was crossed on wooden planks. Part of the line of the footpath can still be seen along the southern side of St Paul’s Church on the opposite side of Maison Dieu Road. From the beginning of the 18th to the middle of 19th century the Gunman and then the Jarvis family owned a magnificent mansion on a vast estate that stretched from Maison Dieu House almost to Stembrook where there was a large tannery. Their mansion faced Biggin Street and the east side of the estate abutted Charlton Back Lane. In 1853 the estate was divided into two along the right of way footpath. 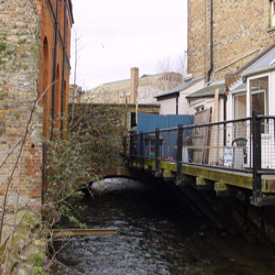 The northern part was sold to William Moxon, who built Brook House and to provide egress into Biggin Street, he built a makeshift bridge across the Dour where the planks had been. Moxon successfully applied for permission to lay out sites alongside the track and the council called it Pencester Road. This was after John de Pencester who had helped to defeat Louis the Dauphin of France (1187-1226) when he held siege to the Castle in 1216 and depicted in a stained-glass window in the Maison Dieu’s Stone Hall. Eventually, fine detached properties were built along both sides of the road with a space left on the south side west of the Dour for what eventually became Pencester Gardens. Most of the properties, although damaged in World War II, were repaired and occupied following the War. Those properties that did succumb were on the southern side and East Kent bus services occupied one of the sites. In 1964, seven of the northern side properties were demolished in order to enable St Martin’s Property Corporation to build the shops with flats above that we see today. Twenty years later the remainder of the original properties along that side were demolished to create a car park, including East Kent buses booking and enquiry office opposite to the former bombsite. In the 1980s properties, east of the Dour and the site occupied by the bus company were demolished to build a bus station. Pressure, at the time, was mounting for a purpose built Magistrates Court and this was built instead. With five courtrooms this opened in December 1987, however, due to the general down grading of Dover as a town of consequence, the court is now mainly used for administrative purposes. The bus station was never built but external bus services, coach services to London and some services within the town operate from Pencester Road. After carefully crossing Pencester Road – it is part of the one-way system and the traffic comes from the left – the walk enters Pencester Gardens. Take the serpentine path to the left alongside the west side of the Dour. What are now the Pencester Gardens was the southern part of the Gunman/Jarvis estate that was sold in 1853. This was bought by William Crundall senior and three years later, in 1856, he bought the former Charlton paper mill (see above) which he converted into sawmill. Using the trees from the former Gunman/Jarvis estate he quickly made his fortune. Once most of the trees were removed, the land became a meadow that was prone to flooding. Over time tall poplar, copper beeches, and other fine trees flourished in the dank conditions and although Crundall used the site for storing timber he allowed it to be used for school treats. About 1880, he sold the meadow to Sir Edward Watkin, (1819-1901), Chairman of the South Eastern Railway, who was planning to build a railway station on the site. His proposed railway was to run from France through a Channel Tunnel to St Margaret’s. When the project failed, Crundall re-purchased the site at less than what he had been paid for it and his son, Sir William Crundall, turned it into a timber yard. In 1922, he sold the land to Dover Corporation and the council, having bought Stembrook tanyard, eventually created Pencester Gardens. In the 1980s Dover District Council decided to build on Dover’s wealth of history to revamp the town as a tourist attraction. Part of their scheme included Pencester Gardens and for this reason, in 1988, the serpentine path along the Dour was laid. At the end of the path, to the left is the next crossing of the Dour, at Dieu Stone Lane. From the bridge, looking south, it can be seen that the river carries on in southerly direction but once out of sight it turns west behind Castle Street. Our walk, from the bridge, takes the path to the right in the same direction as the river goes. Before taking that path, the walk briefly takes a detour left over the bridge to the end of Dieu Stone Lane where it meets Maison Dieu Road and what was once the maritime hub of Dover. From about the 6th century up until the 15th century the Dour split where the river turns sharp right/westward behind the present Castle Street. 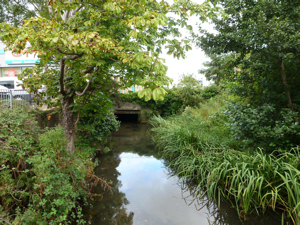 The east stream carried on south entering the sea approximately where Woolcomber Street meets Townwall Street today. 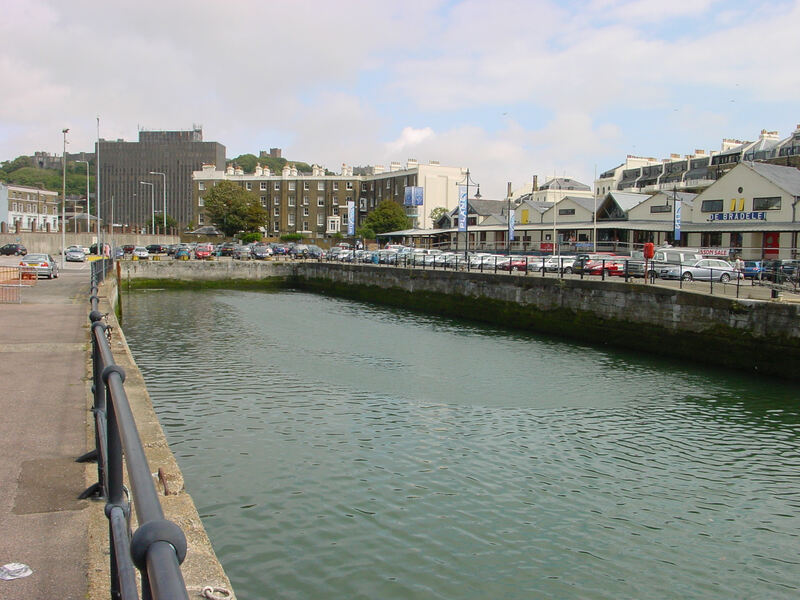 Harbours were formed, one close to St Martin’s monastery, near present day Market Square and another under the Eastern Heights fed by the eastern stream of the Dour, in this area. By the time that William I (1066-1087) invaded England in 1066, the Eastbrook harbour, as it was called, was of national importance particularly for military and commercial purposes. Such was the importance of Dover’s harbours that the King made a grant to the town’s Burgesses to ensure the continuation of their services. However, between 1300 and 1500 there was a movement of land mass that triggered a phenomenon called the Eastward Drift – the tide sweeping round Shakespeare Cliff and depositing masses of pebbles at the eastern end of the bay. This, together with a cliff fall, rendered the Eastbrook harbour useless and a new harbour was created at the western side of the bay. 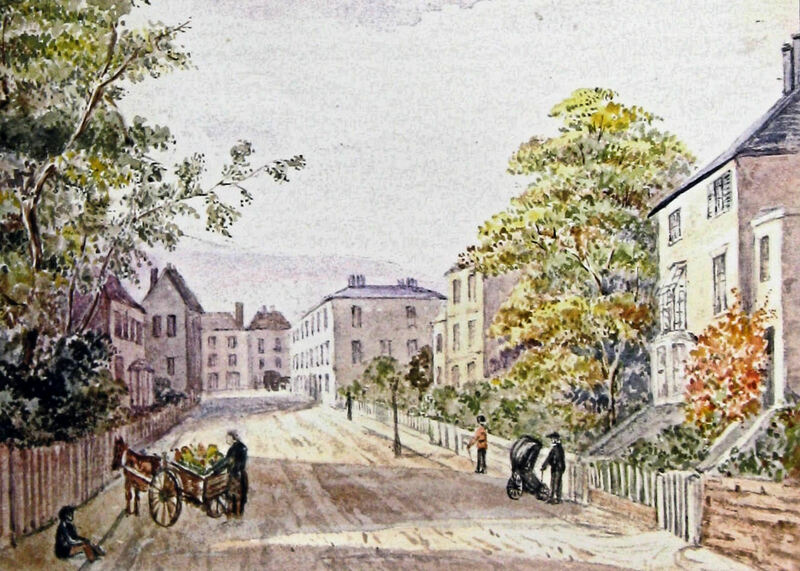 The name Eastbrook Place was given to the early 19th century houses to the right on Maison Dieu Road. Dieu Stone Lane was originally known as ‘D’ Stone Lane after a boundary stone between the town and the lands owned by the Maison Dieu. Hubert de Burgh (1170-1243) founded the latter in 1203 on land north of the then boundary of the Dover town. An ancient right of way that originally went along this boundary from Biggin Street to the Castle and a continuation of this path can still be seen on the opposite side of Maison Dieu Road. That area has national significance that goes back to when King John (1199-1216) signed the Magna Carta in 1215. The Barons reneged on their side of the bargain and invited King Philip II of France (1180-1223) son, Louis the Dauphin of France (1187-1226) to take the throne. The invasion was almost complete with only Dover Castle, under the Constable of the Castle, Hubert de Burgh (1170-1243) holding out. The siege lasted for over a year with the Dauphin and his men camped on the foothills in this area. Almost starving, de Burgh and his men still held out even when they heard that John had died and the Dauphin’s men tried to undermine the North Gate in order to gain entry. When a massive contingent of re-enforcement’s set sail from France to invade, De Burgh secretly left the Castle and set sail with the Cinque Ports Fleet to take the armada on. John de Pencester arrived with his contingent to relieve the Castle and at sea, De Burgh and the Cinque Ports Fleet, eventually on 24 August 1217, routed the French Navy and prevented the invasion of England! On the south side of Dieu Stone Lane is Eastbrook Place, named after the old harbour. In 1887 the building closest to Dieu Stone Lane became a convent for the Sisters of St Vincent and the long wing facing Dieu Stone Lane was added in 1903. 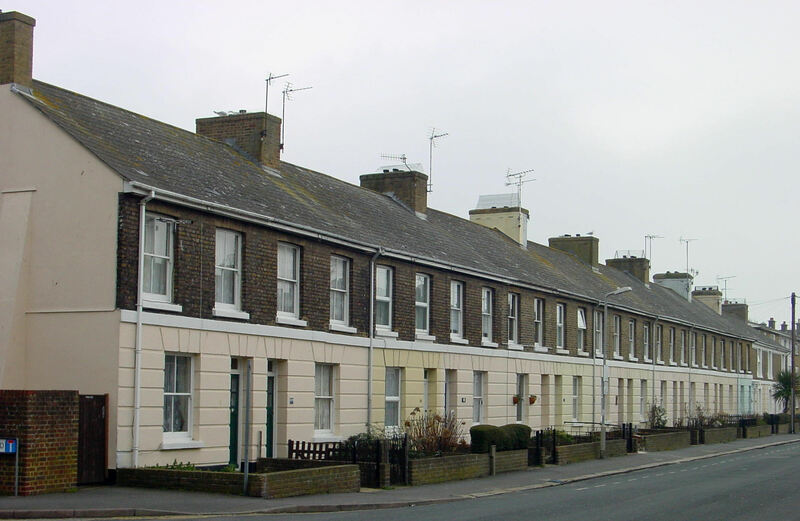 Later the name of the House was changed to St Mary’s but in February 2005, with only five Sisters left in Dover, they sold what had become a residential home. 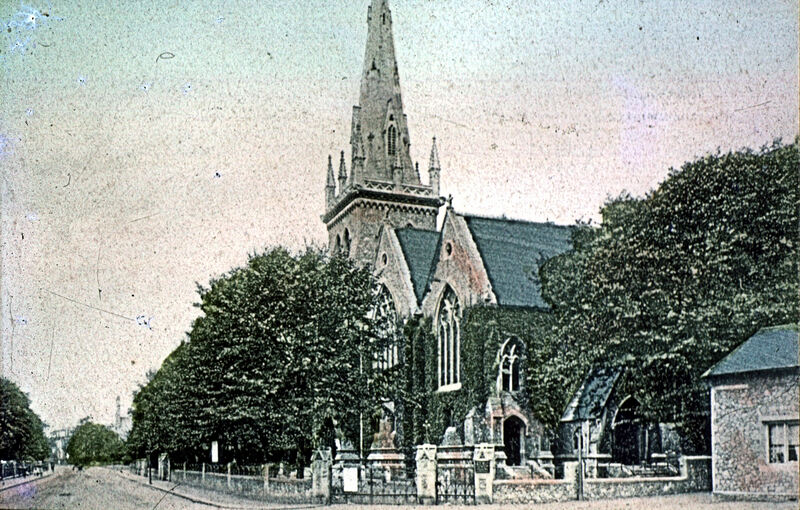 The villas on the north side of Dieu Stone Lane were built in 1881 and on the opposite side of Maison Dieu Road, next to the ancient path and where the Dauphin’s men camped, was the former site of St James (new) Church. Built in 1861, at the same time as Maison Dieu Road was laid and named, it met the spiritual needs of the rapidly increasing population in the area. However, the Church, having suffered some damage during World War II, was demolished in 1952 and is now St Mary’s school playing field. At the far end of the field are the only remains of the Church. Returning to the Dieu Stone Lane bridge, the walk takes the southern path through Pencester Gardens. On the left is Pencester Court, a block of 24 flats on four floors completed in early 1952 behind which is the River Dour. It is recorded that the family of William Hortin, Mayor in 1329, held what was described as being marshy ground between East and West Brook’s of the River Dour, from which the name Stembrook was derived. At the time, nearer to the ancient Eastbrook harbour, were shipbuilding yards while to the west was the municipal stray animals’ pen. There, farm animals that had wondered off their owner’s property were kept until the owner claimed them for a fee. Nearby was the extensive Stembrook tannery that was in this vicinity from at least the 14th century. 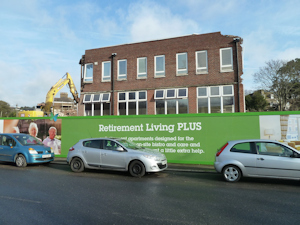 On leaving Pencester Gardens, a former supermarket is on the left on the site of what was once Stembrook corn mill. The five storey mill was built in 1792, when troops were being moved into Dover just before the start of the Napoleonic Wars (1793-1815). Following the Napoleonic Wars, Caroline Place was built where Stembrook car park is today. Consisting of small cottages, they were specifically named after George IV’s (1821-1830) wife, Caroline of Brunswick (1768-1821), even though it brought the town into direct conflict with the Royal Family and the government of the time. Caroline was the estranged wife of George and when she arrived in England for his Coronation, against the wishes of George and the government, the people of Dover welcomed her. Not only that, but George was seeking a divorce and when his witnesses brought from the Continent to make accusations against her, the people of Dover made it clear that they were not welcome! Nonetheless, the beleaguered Queen was subjected to a humiliating eleven-week inquiry by the House of Lords, as the Peers looked for possible ways to secure a divorce but failed. In the end, on the day of the Coronation, Caroline was barred from entering Westminster Abbey and although it was June the weather was atrocious. Caroline caught a cold from which she subsequently died. Caroline Place succumbed to World War II attacks and because the Queen’s full title was Caroline of Brunswick it was decided to call the new car park, Stembrook. Of interest, in 1968 it was Dover’s first car park to levy parking charges. St Mary’s Church from the south-east facing Stembrook. LS. The close proximity of Stembrook Mill meant that the little cottages were subject to damp and this was emphasised in the Rawlinson Public Health Report on Dover in 1849. At the time it was recommended that the mill should be demolished but this did not happen until 1918. Nonetheless, on what was marshland a large triangle of poor quality properties were built opposite the mill with the east side facing the mill, the south side facing Castle Street and the west side facing Church Street. At the top of Church Street is St Mary’s Church – although not part of the walk is well worth a visit. The walk continues along the present day Stembrook between the former supermarket and the Stembrook flats on the right. During World War II the popular British Restaurant opened on Stembrook where civilians could purchase a three-course meal, ‘off the ration’, for 9d (approx. 4p)! Later renamed the Civic Restaurant, it was the centre of controversy following the War as it was seen as a public enterprise competing with commercial restaurants. As most of the Stembrook properties had succumbed to War damage in 1947 Compulsory Purchase Orders were granted that enabled the Corporation to acquire all the properties at their site value. In 1949, plans to build flats on the site were given the go-ahead and the following year all the pre-war premises were cleared away. In the meantime, the council sold the land to the Post Office who envisaged building an automatic telephone exchange on the site! As the Post Office’s plans were still unclear the council wrote a caveat that enabled them to re-purchase the land at the same price if the Post Office changed their minds. By 1955, the Post Office had not taken up the option and the contract was terminated. The council, using government Reconstruction Grants built thirty-four flats that became Stembrook Court, two showrooms that were leased to two automobile firms on Castle Street with a pub on the corner of Church Street and Stembrook. During the excavation for the pub’s foundations, a Roman quay or wooden causeway, was found and nearby evidence of a Roman bath as well as tiles, pottery, glass and part of an Andernach (Germany) lava millstone. Because of these finds, the new pub was named the Roman Quay and opened on 31 July 1957. The total cost of the development was £80,000. 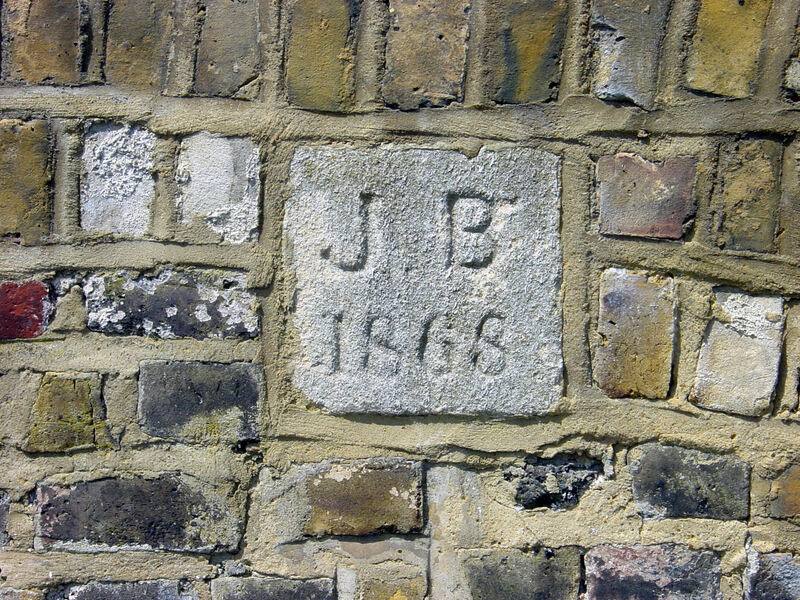 High up on a wall near the corner of the Stembrook flats and Castle Street is a Dover Society plaque dedicated to arguably Dover’s greatest artist, William Burgess (1805-1861). Born in Canterbury, Burgess learnt his craft while working for his uncle painting horse drawn coaches. About 1828, with his wife Harriet, Burgess settled at 14 Stembrook and over time his work was exhibited at the Royal Academy and the Royal Society of British Artists. In 1844, Burgess opened a Cosmorama that enabled the viewer to see his sketches and paintings of Dover as if they were looking through a window. Even though Burgess was nationally already recognised as an artist of repute, the attraction was so popular that it served to bring his work to a wider audience. Some of Burgess’ work is on display in Dover Museum, Market Square. The walk, from the top of Stembrook will go across Castle Street to Dolphin Place but before crossing the Street, there are two items of interest to see. The first is on the right at the corner of Castle Street and Church Street. 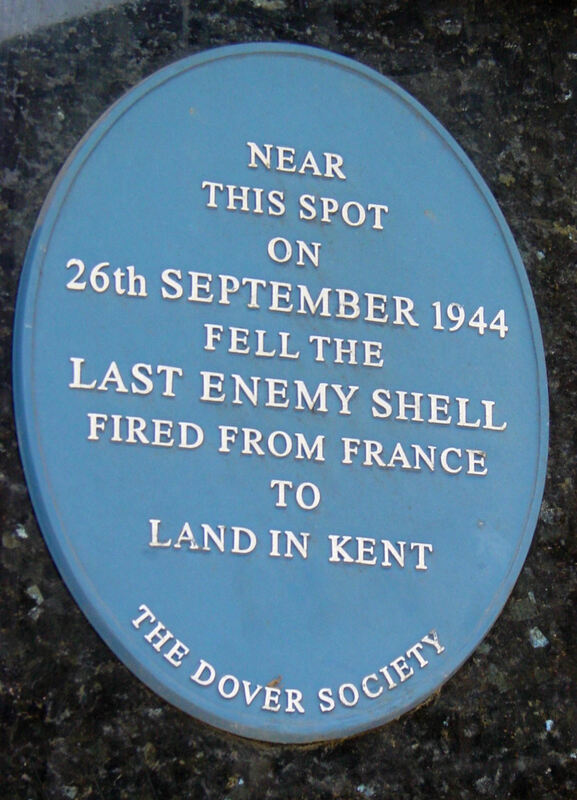 Again, fairly high up, is another Dover Society plaque that commemorates the last shell to hit Dover during World War II causing material damage. For four years the town was under constant bombardment that gave rise to the town’s nickname, ‘Hell Fire Corner’ and ended on 30 September when the last shell fired on Dover by German cross-Channel guns. Four days before, on Tuesday 26 September 1944 at 19.15hrs a shell to do material damage hit Hubbard’s Umbrella Shop and it is to this that the plaque was dedicated. The other item of interest is across the entrance to Stembrook and past the carpet shop on Castle Street. Between the shop and the older building is all that can be seen of the bridge that was built in 1832, to span the Dour. In the deep gully there are the remains of the former Stembrook corn mill’s wheel pit that, at times, can still be seen. From Castle Street, the Dour goes through a culvert, initially diagonally then straightens up to re-emerge in St James’ Lane. Before Castle Street was built, between 1830 and 1835, Stembrook extended to Dolphin Lane. Following the opening of Castle Street into Market Square the southern section of Stembrook to Dolphin Lane was renamed Dolphin Place. In ancient times Dolphin Lane was a narrow road between the town and the Castle but with the development of the Eastbrook harbour, the much wider St James Street to the south, evolved. By the 17th century this was the main thoroughfare linking the town to the Castle, St. James (old) Church, the nearby maritime community and the roads eastwards along the coast. A century later, the St James area was an upmarket residential area and although the grand mansions were replaced by houses and commercial businesses, up until World War II, it was relatively prosperous too. However, during World War II much of the area was totally devastated with only properties at the Castle end surviving. Today, St James’ Street main legacy is that of its name, which has been given to the long awaited £53million St James retail and leisure shopping park that opened in 2018. Sadly, all traces of Dolphin Lane was eradicated in the name of progress. Having crossed Castle Street, the walk takes us down the short Dolphin Place alongside waste ground. Not that long ago, the once majestic Granada Cinema stood here but was bought by the pub chain, J D Wetherspoon, who allowed the building to rot. When there was hope for restoration the company sold the building to speculators who had it demolished, possibly to make a nice profit now the St James Development has been completed. The former building, however, still leaves a legacy – unique piece of building technology – and it still exists under the site! 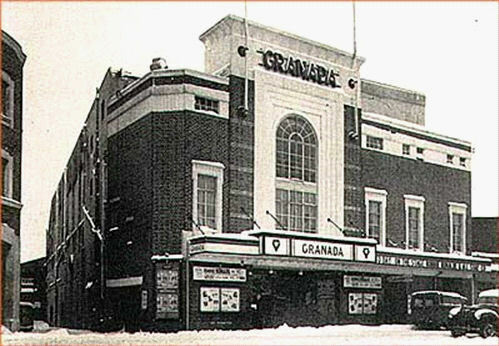 Back in 1927 the site was the barrel yard of Leney’s Phoenix Brewery and they sold it to Sidney Bernstein (1899-1993) in order for him to build a picture palace that would reflect, ‘… the vast extravaganzas of Moorish and renaissance architecture where the working class could be royally entertained…’ The grand Granada cinema opened on the site on 8 January 1930 with a magnificent exterior of white stone and mottled brickwork. A huge glass window dominated the front elevation. The building contractors were Bovis (1928) Ltd. and work had started on 14 May 1929. Their main problem was that the original bridge over the Dour had ran into problems as the southern end had finished in a bog. This had been dealt with by taking the river through a 22-foot (6.7 metres) wide culvert running diagonally across Castle Street. As the nearby Leney’s Phoenix brewery expanded to create the barrel yard they had covered the area, including the Dour, with metal sheeting, topped with aggregates and paving. To carry the weight of the proposed cinema, the Bovis engineers erected concrete walls on either side of the Dour and further sets across the boggy land, which they then drained and filled with aggregates. The whole was then spanned with steelwork and concrete and the metal frame of the cinema was anchored in the concrete. In some places this was only 18 inches (0.45metres) below ground level but it worked. Dolphin Place, as already noted, was originally the southern part of Stembrook that once led to the ancient Dolphin Lane and the name dolphin comes from the old name for mooring posts used for tying ships to the quay of the early harbour. It is recorded that there was a brewery in this area in 1740 for that year the Clements family were taking the water from the Dour in order to brew ale. As the brewery expanded the owners sank a deep artesian well and by 1808 the huge concern was owned by James Walker, when he had the first steam pump in Dover installed. The water was pumped up to a huge tank on the roof of the brewery and pipes and taps were installed. Alfred Leney senior (1837-1900), together with a silent partner, bought the brewery in the 1860s and proceeded to expand the business. Renaming it the Phoenix Brewery, it became one of the leading suppliers of the beverage in Kent. As the brewery expanded, former residences in Dolphin Passage and Dolphin Lane were either demolished or incorporated as malting houses and other ancillary uses as required. These include the residences that can still be seen in Dolphin Place. Eventually, the first part of Dolphin Lane, which ran from Market Square to the Castle, became the carriageway to the brewery and the public Lane was realigned to start on the Castle side of the brewery! However, the Phoenix Brewery’s main problem was the regular flooding of the Dour such that sandbags were stored in the brewery yard making the entrance to the premises difficult. Having already sold off part of the premises, the brewery was amalgamated with Fremlins in 1927 with only the bottling plant remaining. This closed in October 1952 but it was another seven years before the brewery chimney was demolished. The company also had a table water factory in Russell Street but this closed in 1953. The site of the then proposed St James Area Development was investigated by Canterbury Archaeological Trust before development took place. The history of this development project is of interest and starts with the devastation from bombing and shelling of the area during World War II. Following the War, in February 1949, the Minister of Town and Country Planning gave the council the right and the financial help to compulsory buy, war damaged land and property in various parts of the town. Albeit, for reasons that no one could understand – other than the government knowing that it would cost them a great deal – this did not include the devastated St James area. In consequence, the problem fell on the cash-strapped Dover Corporation. Speculators moved in until they found that there was no quick profit to be made and equally as quickly moved out. In consequence, as cash became available, the council bought up the bombsites and to attract businesses to build on these site, provided cheap long-term leases and generous planning permission. Legitimate businesses included Southern Television studios, Townsend Thorensen ferry company offices, East Kent Road Car Company garage and the Holiday Inn. Other, not so salubrious developments, also took place, most notably the 12-floor Burlington House and Dover’s first multi-storey car park. 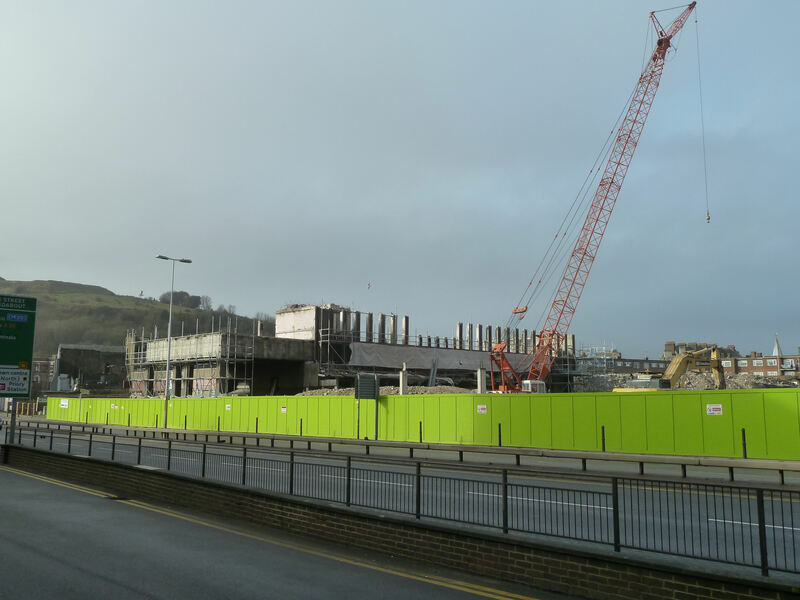 Further, the area was seen as a hotchpotch of building with a large make-do car park and in 1995, Dover District Council (DDC) decided to revamp the whole area. They launched an indicative Master Plan for a new future and for the next four years a lot was said and written but nothing materialised. 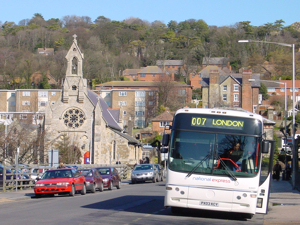 Then in 1999, DDC renamed the area the Dover Town Centre Investment Zone (DTIZ) and according to the then Chief Executive John Moir, it was expected to ‘quickly bare fruit.’ Over the next few years most of the business that still remained moved out and various exciting schemes were floated but came to nothing. In 2011, yet another scheme was launched but little notice was taken as the empty Burlington House still dominated the blighted area. This was demolished in 2016, since when yet another plan was launched and the recently opened St James shopping centre is the result. Between the St James retail and leisure shopping park and the Dour is St James Lane, another ancient thoroughfare. 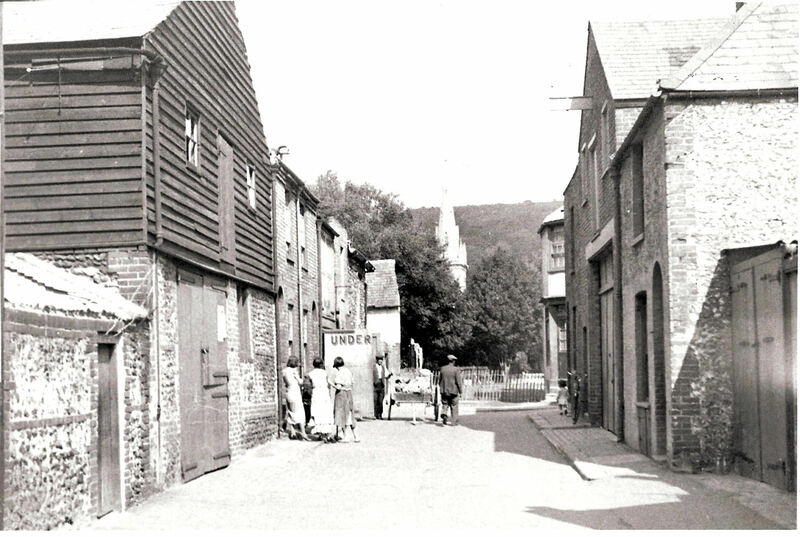 In Saxon times it was one of Dover’s principle quays and before World War II it was a vibrant street that connected Townwall Street with St James Street, King Street and Dolphin Lane. 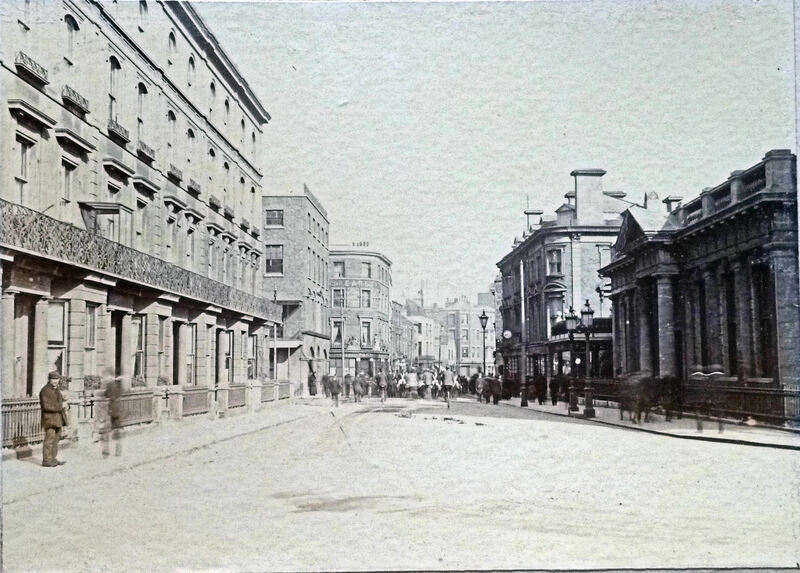 The first lane on the right, Flying Horse Lane, once connected St James Street with Kings Street and until 1892 was called St James Street, of which it was part. Why the name of the street changed is to do with an ancient hostelry, the Fleur de Lis that was in existence at the time of the Civil War (1642-1651). During that time, Richard Dawkes conspired with his friends to take Dover Castle for the Roundheads. By the late 18th century stage coaches left the Fleur de Lis to London, including the Flying Horse – the fastest mail coach. For this reason the name of the pub was changed. In 1892 the inn was demolished to make way for a new General Post Office and in honour of the ancient inn, the thoroughfare was renamed Flying Horse Lane! The bridge over the Dour probably dates from the 14th century as it contains late medieval stonework and the riverbank is lined with similar stone. It is believe by some that this stone work is evidence that once there was a town wall that went along St James Lane. The pub on the corner, the Lord Nelson dates from 1805 but the pub we see today was rebuilt in 1873 following a destructive fire. The next lane to the right off St James Lane is Fishmongers Lane where the Dour is crossed by another ancient bridge that contains late Medieval stonework. Originally called Kings Lane, then Butchery Lane – after a town wall tower that once stood nearby. 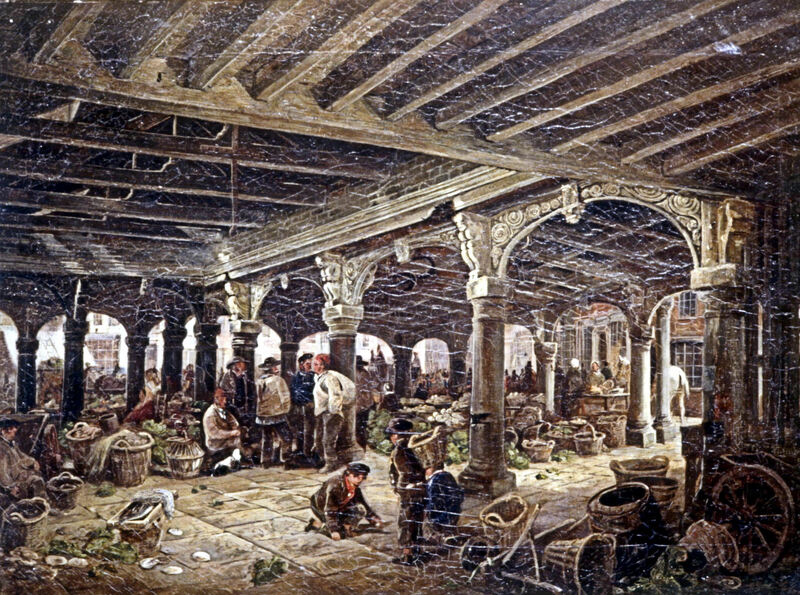 In 1836 the fish market opened and the thoroughfare was renamed Fishmongers Lane. However, in 1852 the market moved to the Crosswall, between the Tidal Basin and Granville Dock, and an ice store opened on the site. This was demolished by enemy action during World War II but the Lane has retained its early 19th century name. Hardly discernible but nevertheless still there is the tiny Mill Lane that runs parallel to the Dour. A tidal mill was recorded nearby in the 1086 Domesday Book and it is believed that this eventually caused a build up of silt that made the Westbrook un-navigable. At the time the Dour at Eastbrook was already a harbour and the silting of the Westbrook ensured it became the Dover’s main harbour. Besides the tidal mill, there was the town’s mill and this was on Mill Lane. It is recorded that it was rebuilt in 1520 and possibly because the new bridge was blocking the flow of the river, it was demolished and rebuilt again 1587. 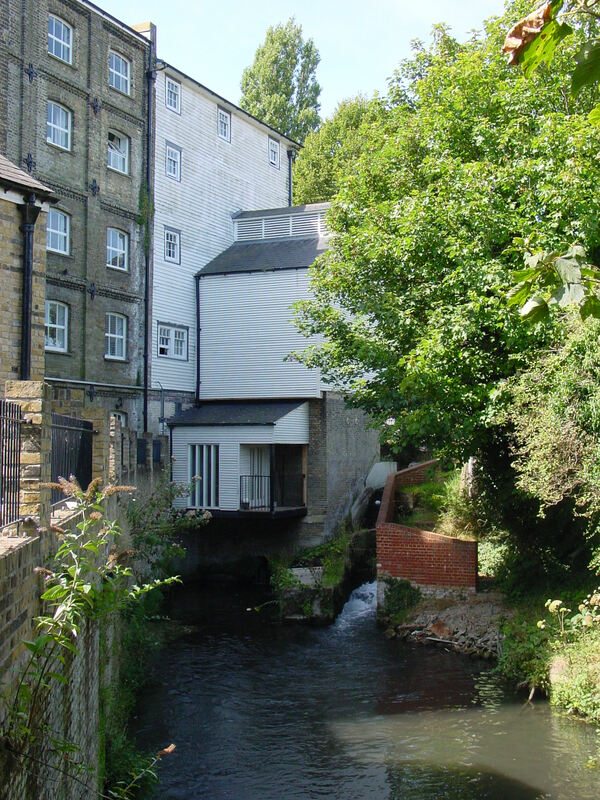 That year John and Edward Milwarde acquired the lease from the council that obliged them to provide ‘two seams of good wheaten meal, to be sold for the poor and other inhabitants of Dover at a charge corresponding with the neighbouring markets.’ By 1821 the mill had fallen into disuse and John Minet Fector (1754-1821) had the mill dismantled and transported to his new home, Kearsney Abbey. There the internal workings were used to pump water to the Abbey and the remains were incorporated into the waterfall there along with remains from Dover’s Town Wall. Shortly after the Pilcher family built a new mill on the former Mill Lane mill site but milling ceased in 1889. The former corn mill became a corn store until 1924 and then it was allowed to become derelict. 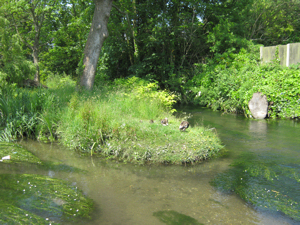 The mill was eventually demolished in 1953 but the foundations are still visible in the river. The walk now enters the very busy Townwall Street, the Dover end of the M20/A20 route to Eastern Docks. The crossing to the sea side is via the underpass accessed on the right. As for the town walls, there is documentary evidence that Dover was at least partially walled from the 11th century and in April 1340 Edward III (1327-1377) proclaimed that persons living within six miles of Dover were to withdraw to within the walls. Since then there have been countless other references to Dover’s town walls and indeed, in the early 19th century one of the towers housed the town’s lock-up. Yet recent archaeological evidence and document research have questioned their existence. Of those archaeologists who agree that Dover did have town walls the general consensus is that one ran along the southern side of St. James’ Street. 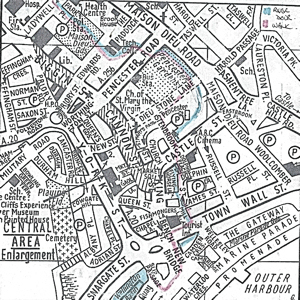 It has also been suggested that Townwall Street may have been built at a later date than the walls on reclaimed land and outside of the walls. Pedestrians, like the Dour, get to the seafront under Townwall Street but the river is in a culvert! The pedestrian underpass, on the right, was excavated in 1992, when the A20 was brought over the western cliffs and along Townwall Street to Eastern Docks. During the excavations archaeological surveys were undertaken by Canterbury Archaeological Trust led by Keith Parfitt. 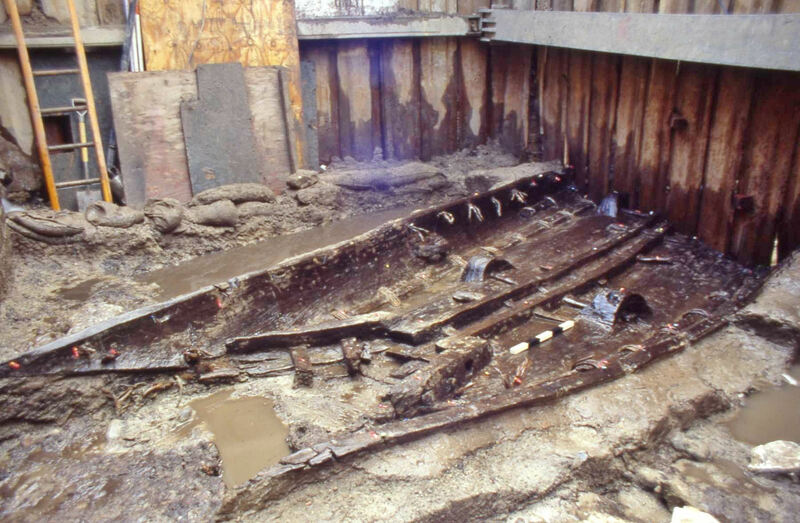 On the morning of 28 September Nick Edwards, operating a Caterpillar excavator for the contractors Norwest Holst, uncovered what turned out to be a Bronze Age boat – believed to be the worlds oldest known seagoing vessel! This was discovered near to the path from Townwall Street leading down to the underpass and a Dover Society plaque is positioned near the spot where it was discovered. The preserved boat can now be seen in Dover’s Museum and it is well worth a visit. The underpass brings the walk to New Bridge, near the sea front. Originally built in 1800 to span the Dour and was so called to distinguish it from Buggins Bridge that crossed the river further east. Since then most of the original New Bridge has been demolished and rebuilt with greater width on several occasions. The Dour, these days, can still be seen over the eastern parapet, next to New Bridge House. At the seaward end are Camden Crescent and Granville Gardens and their stories can be read on this website along with the story of the creator of Camden Crescent – William Sankey (1789-1866) and famous residents Cuthbert John Ottaway (1850-1878) – England’s first football captain and Charles Dickens (1812-1870). In the centre of New Bridge is the Grade II Listed Rifles Monument which has a colourful history. On the west side is the boarded up but elegant Cambridge Terrace that was built in 1856, named after Prince George the Duke of Cambridge (1819-1904) and owned by Dover Harbour Board (DHB). Why the tenants, mainly organisations and businesses, were given days to leave by the DHB back in 2009 is unknown. Nonetheless, the building of the Terrace, part of which straddles the Dour, was an engineering achievement in its day. In March 1852, a 10foot to 14foot diameter culvert was built by Henry Lee & Sons of Chiswell Street, London, under the newly constructed Northampton Quay for the Dour to flow into Wellington Dock. While this was being undertaken, the Harbour Commissioners – the fore-runners of the Harbour Board – decided to extend the brick culvert by 330feet to enable the building of properties on the west side of New Bridge. The culvert was strengthened using Medina cement and bricks to form ‘masses 2feet long.’ The Medina Cement Company had been established on the bank of the Medina River, Isle of Wight, around 1840 and by the mid 19th century, the company had acquired the reputation as a pioneer in cement concrete. Before the culvert was completed the Commissioners decided to build the tall, elegant terrace and in consequence the culvert was further strengthened. This narrowed the aperture through which the Dour flows and during heavy wet weather this causes the Dour to back up. To try and relieve the situation, the Dour, on the eastern side of New Bridge is in the deep cutting. Following the Terrace round brings the walk into Cambridge Road that was laid out in 1835. At the time the Harbour Commissioners were floating a Bill in Parliament to raise money to undertake much needed work on the harbour. The following year, 1836, the South Eastern Railway Bill was given Royal Assent and its promoters planned to end the line at Folkestone. A government inquiry concluded that the railway line should terminate at Dover and that the harbour should be improved (see Harbour of Refuge story part one). Subsequently, the Tidal Basin was enlarged and the Pent, into which the Dour flowed, was scoured and lined. Using the excavated mud, Northampton Quay and Street were created and what became Ordnance and Commercial Quays were laid. The Pent was renamed Wellington Dock and opened on 13 November 1846 by the Duke of Wellington (1769-1852) Lord Warden of the Cinque Ports (1829-1852) and chairman of the Dover Harbour Commissioners. In the meantime the railway line opened to Dover in February 1844 and after traversing the cliffs was laid on wooden trestles along the along the edge of Shakespeare Beach. From there it terminated in Dover’s Pier District by the harbour. Since early Tudor times Dover’s shipbuilding industry had gravitated to Shakespeare Beach and with the building of the railway, they were forced to move out. 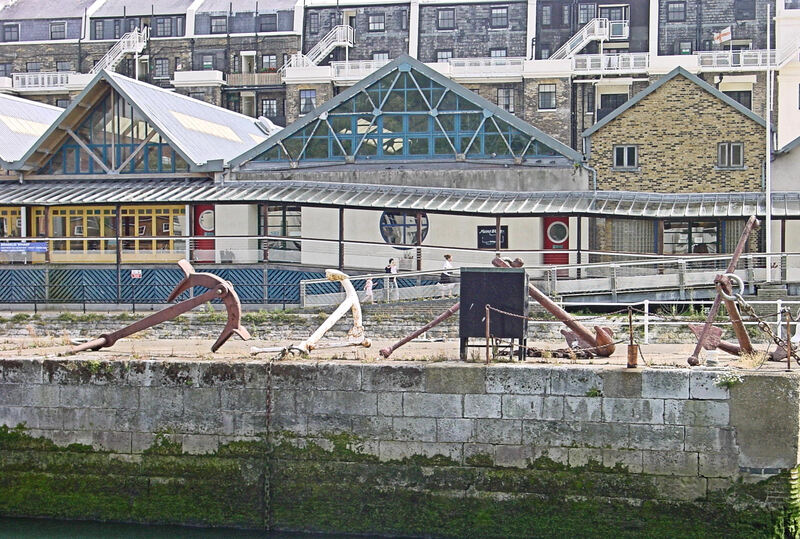 To deal with the problem, the Harbour Commissioners built three large sheds between Cambridge Road and Ordnance Quay at the side of Wellington Dock. They also converted the track used for excavating the mud and silt out of the Pent when creating Wellington Dock into a slipway for the ship builders and erected the Fairbairn hand cranked crane that can be seen at the far end of Cambridge Road. As iron hulls started to supersede wooden hulled vessels, the number of ship builders declined. Following World War I (1914-1918) the Dover Harbour Board (DHB) Marine Engineering department occupied the eastern shed, South Eastern and Chatham Railway – later Southern Railway – Marine Department the middle shed and the westerly one was Cullins’ shipyard. Between the Marine Department and the Railway Marine Department was Tapley’s Central Garage. Wellington Dock, the surrounding quays and building were badly damaged by bombardment during World War II, then following repairs, the three sheds were converted into one building. Temporary divisions were installed and then let to various occupants but the sheds were mainly used as DHB’s workshops. In the early 1990s Dover Transport Museum occupied the former sheds until the summer of 1996, when DHB along with factory shopping specialists De Bradelei Mill converted part of the buildings into a factory outlet shopping centre. The outlet proved successful and the following year the remainder of the buildings were converted giving 80,000 square feet, with a restaurant opening in the former Cullins boat yard at the western end. The former quays were converted into a car park and the whole renamed De Bradelei Wharf. The entrance to these car parks brings us near to the end of our walk – Wellington Dock. Wellington Dock at the eastern end appears to have two ‘prongs’. The left ‘prong’, adjacent to the shopping complex, is the remains of the slipway. Note the twin iron tracks that were once used when hauling ships onto the slipway. On the opposite side of the slipway, between the two ‘prongs’ are artefacts found during dredging the Wellington Dock and restored by Richard Mahony. On the far side of the car park, in a cobbled area, short steel tram lines remain. These were part of the town’s extensive tram system that operated between 1897 to 31 December 1936 and this part was Northampton Street. Finally, in between is the second ‘prong’ of Wellington Dock and at this end is nicknamed the ‘Bubbles.’ This is due to the effect of the Dour entering the Dock at this point. This entry was posted in Maritime, Open Spaces, River Dour Part II – the Walk Section II from Barton to Wellington Dock, River Dour Part II – the Walk Section II from Barton to Wellington Dock, River Dour Part II the Walk Section II - from Barton to Wellington Dock, Tourism. Bookmark the permalink.